Jimmy Fallon's Tonight Show guests in Central Park included Blake Lively. If you think Jimmy Fallon is excitable every night as host of The Tonight Show, you should see him in person as the first late night host to film an episode of his show in New York’s Central Park. That’s what happened on Thursday night, and Adweek attended the taping of the Central Park episode, which was sponsored by T-Mobile. And that brand partnership was impossible to overlook. 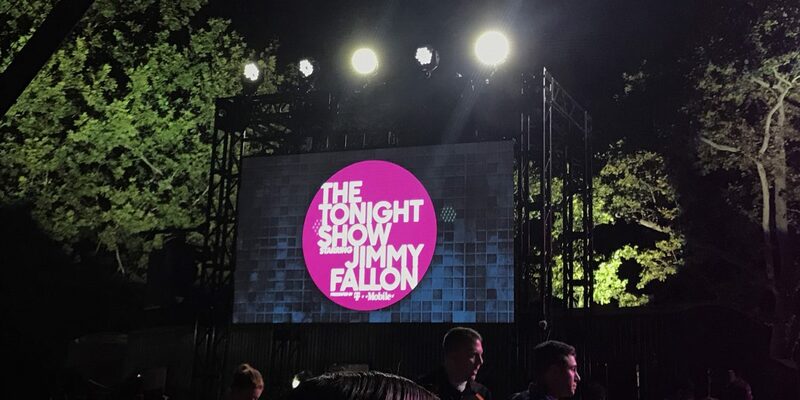 For starters, The Tonight Show Starring Jimmy Fallon’s usual white logo was turned a T-Mobile-shade of magenta for the evening. The sponsored logo was on display on banners near where the episode was filmed, at a makeshift set in Central Park’s Rumsey Playfield. T-Mobile, which sponsored the episode, was added to The Tonight Show's logo. Magenta VIP tents were located in the back of the audience and would have come in handy had the skies poured down rain, as they seemed to threaten early in the evening. Instead, the night remained an ideal breezy temperature to watch Fallon’s comedy routine. As Fallon noted in his monologue, he’s a New Yorker—born in Brooklyn and raised in Saugerties—and the host seemed genuinely excited to be filming in Central Park. He also thanked T-Mobile during the monologue, said it was “great” to work with the brand. NBC’s Central Park set was able to accommodate over 1,500 audience members, a sizable increase from the 200 or so who attend tapings in the show’s usual home, Studio 6B, at 30 Rockefeller Plaza. 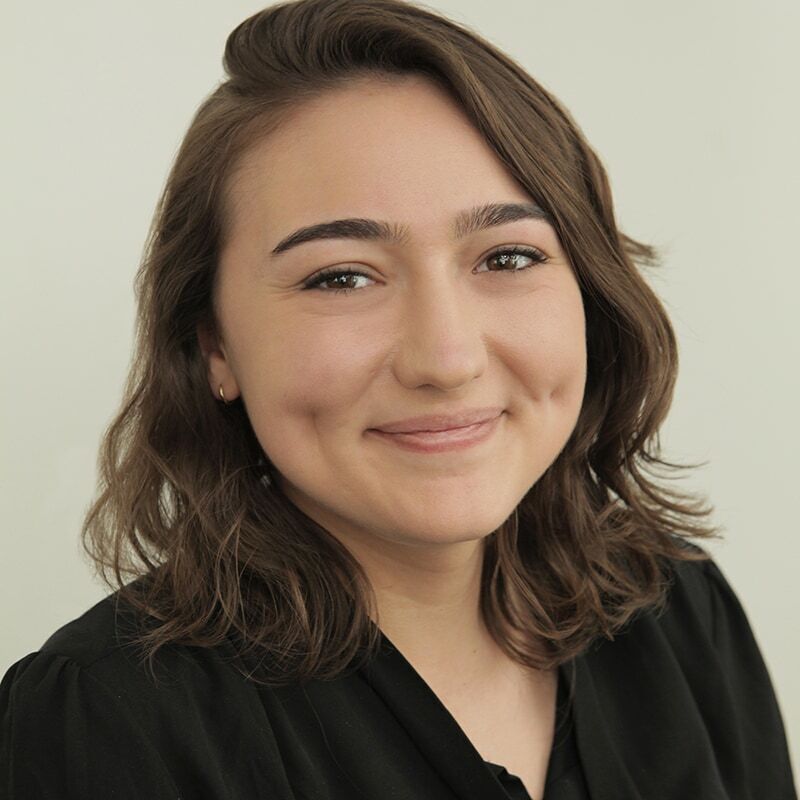 The set and scenery, which the show started assembling in June, and began constructing on-site last Sunday—with help from more than 100 crew members—was impressive. And the crew moved seamlessly transitioning in between segments. The episode included a game between Fallon and his guests: Blake Lively, who was promoting A Simple Favor; Carrie Underwood, promoting her new album, Cry Pretty; and Crazy Rich Asians actor Henry Golding. Fallon also interviewed Lively and Underwood. During Underwood’s performance of “Love Wins,” the crowd got another taste of the T-Mobile sponsorship, as sticks and bracelets were passed around for them to wave, which lit up magenta and were branded with the company’s name. 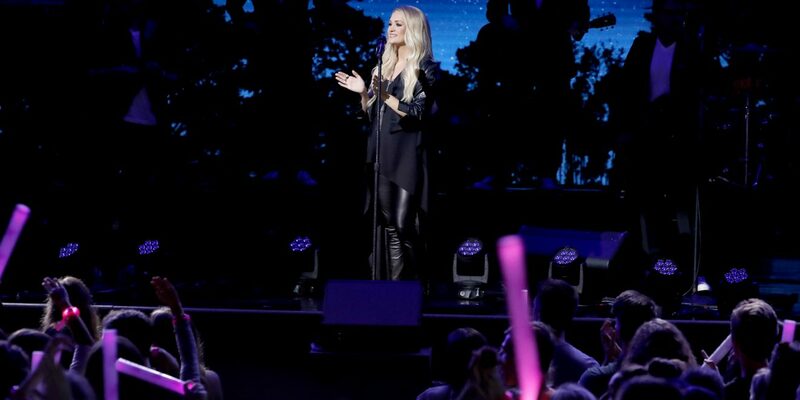 The audience waved T-Mobile-branded sticks during Carrie Underwood's performance. The audience’s enthusiasm jazzed up Fallon, who returned on-stage—after running through the crowd—to perform two karaoke-style songs with Underwood that won’t appear on-air. The first? Post Malone’s “Psycho,” which went about as well as you’d think. So Fallon and Underwood cut that one short and switched to a song with different vibe: Kenny Rogers and Dolly Parton’s “Islands in the Stream,” which seemed to be a better fit for them. The entire crowd responded and again lit up the night, not with the T-Mobile magenta hue that had set the tone up until that point, but with the glare from their cell phones that shot up to record it all.